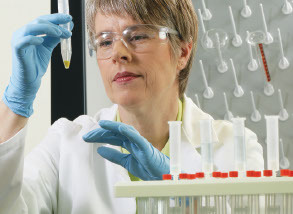 We offer a broad range of innovative Thermo Scientific chromatography, mass spectrometry, laboratory equipment and plasticware products for food safety analysis. Our GC-MS and LC-MS systems, for example, provide you with complete end-to-end food analysis workflow solutions. Along with our educational resources, you can put your focus where it should be—delivering safe, high-quality food products. Automate solvent extraction, solid-phase extraction and evaporation to reduce time and labor costs while still obtaining more consistent and accurate results. Ideal for vitamins, pesticides, lipids and other food constituents. Choose from innovative basic starter-line to highly customizable high-pressure systems, ideal for the analysis of food constituents such as carbohydrates, organic acids, and sugar substitutes. Liquid chromatography is used in food analysis for the vast detection of the majority of analytes. We offer the next-generation Thermo Scientific Vanquish UHPLC System and UltiMate 3000 HPLC as well state-of-the-art columns. Featuring instant-connect injectors and detectors, newly designed Thermo Scientific TRACE GC systems increase productivity and reduce cost of ownership in an easy-to-use compact system. Extend your dynamic range and meet your laboratory’s stringent food analytical requirements, using our comprehensive set of high-performance LC-MS system solutions including the Thermo Scientific Exactive Plus Orbitrap. The new Thermo Scientific Exactive GC Orbitrap GC-MS System is one of several GC-MS systems available. Screen for known and unknown contaminants in food. Get fast, sensitive and accurate results, from the most complex matrices. Measure trace levels of toxic, and essential and nutritional elements in food at ppm to sub-ppt levels using Thermo Scientific ICP-MS products, such as the Thermo Scientific iCAP RQ ICP-MS compact, bench top system. Use Thermo Scientific Gallery and Arena System Reagents to simplify colorimetric or enzymatic analysis of different sugars, acids, calcium, copper, magnesium, iron, potassium, protein and lipase in food. Tomorrow’s Quantitation gives you the workflows you need to provide better answers to more analytical challenges in food safety. Click on the boxes below to explore resources related to your area of interest.